Call us for more information on our fundraising programs. Celebrating Home Fundraising and Home Interiors Candle Fundraisers are now known as LaTeeDa Fundraising! I value the opportunity to work with you and your organization in reaching your fundraising goal this season. 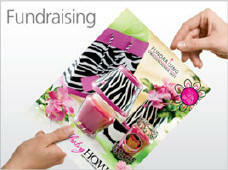 We invite you to view our new LaTeeDa Fundraising brochures and discover what our programs can offer your organization. We offer up to 50% profit, no upfront costs, free shipping, and free pack-by-seller. With a variety of candles, wax melts, aroma beads, and cutting boards your supporters will be delighted to shop from beautiful brochures. They'll appreciate the exception quality of the products and the affordable pricing.